A decentralized global Wi-Fi sharing network. Users can share their spare or idle WiFi and be rewarded with Qlink Token. A decentralized billing system to re-package mobile data and excessive data selling to whoever wants to buy. Especially useful for content distribution on mobile network. A decentralized Enterprises Telecom Service, sucn as SMS / voice / data services on Qlink. Build decentralized telecom infrastructure. Users can deploy Qlink BaseStation supporting LTE-U protocol and POW + POS consensus algorithm mining. This white paper explains the technical architecture of the decentralized mobile network. By utilizing blockchain technology, Qlink applies digital identities to telecom assets, repackages those assets, and records the usage footprint of each asset to a distributed ledger. Additionally, Qlink aims to launch applications designed to allow peer-to-peer sharing of assets, including Wi-Fi, mobile data access, and enterprise-to-peer SMS. While improving the efficiency of existing networks, Qlink plans to launch its custom base stations, including a model suitable for vehicle installation. By utilizing the idle resources of network equipment, these base stations will allow users to become a part of the cryptoeconomy, and at the same time create a decentralized solution to cover network black spots. 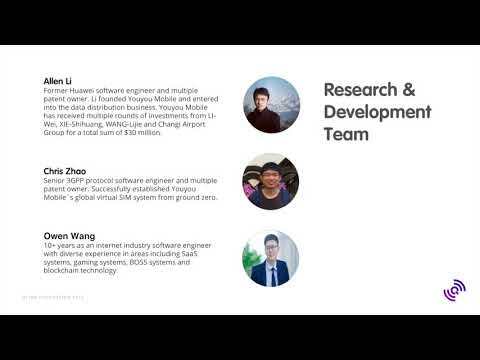 Qlink has assembled a team of seasoned telecom and blockchain developers, along with experienced business and marketing professionals. Allen Li, founder of Qlink, previously founded Youyou Mobile (invested by Alibaba Capital), which is a leading mobile data distributor in China and Southeast Asia, and has partnered with 40 telecom operators around the world to provide mobile data services to 6 million customers. Qlink’s R&D team has spent last four years working for Youyou Mobile, and developed the company's first virtual SIM card bank. The Qlink ecosystem is supported by the Qlink token (QLC). QLC is the utility token used to settle every transaction on the Qlink network, functioning as a cryptocurrency to measure the value of assets and content. The team is still young and a lot to learn. They are not treating the investors with the right attention and they are spending way to much of their funds into conferences instead of real work. This is a major negative for such project. They also not serious with delivery of product (MVP) on-time as advertised. They work hard at workshops to explain togheter with NEO team explaining their new Android Application and their overal dApp application with success. The vision is great and to the future. Perfect for a mobile life but yet to see on what market it is required to be tapped. Usually on a high-expensive DATA band countries. I've tried their MVP the UI/UX is clean and great. Still a lot to develop & buggy. Also their contests over exchanges are bogus and are involved in Wash-Trades schemes & not delivery of rewards .